It is vitally important that all anglers are familiar with and adhere to the new C&R rules and legislation for 2016 online pharmacy oxycontin. See below : River Regulations This information can also be downloaded on the download page if you wish to share. This information can also be downloaded on the download page if you wish to share. With the warmer water temps eggs are busy hatching in the trays at the moment. This will last another week or so. 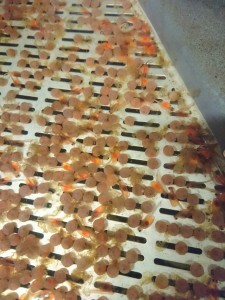 The alevins fall through the gaps in the trays to a special substrate at the bottom of the tanks and will spend the next 3 weeks or so absorbing their yolk sacs, which contain all of the nutrient they need for early life in the wild. The final grade has taken place at the hatchery - this is where fish are passed through a grid to sort out smaller fish that will not smolt this year from larger fish that will be stocked out as smolts. 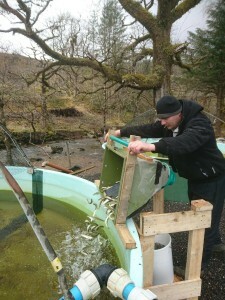 As a result, we now have the final amount of smolts this year. 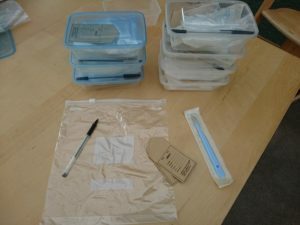 45,000 fin clipped smolts will be stocked over the coming month into beats 1 to 4 of the River Lochy. The final grade has taken place at the hatchery – this is where fish are passed through a grid to sort out smaller fish that will not smolt this year from larger fish that will be stocked out as smolts. As a result, we now have the final amount of smolts this year. 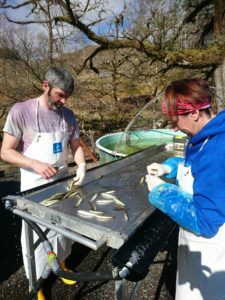 45,000 fin clipped smolts will be stocked over the coming month into beats 1 to 4 of the River Lochy. Last year's fry are on their way through the parr stage as we speak....have just moved 44,000 parr from our Loch Arkaig facility to the hatchery and have left 37,000 larger pre smolts on site. After a grading to take out the smallest fish, these 2 stocks will then be combined to form our smolt stocking output this spring. 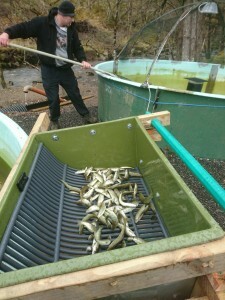 Last year’s fry are on their way through the parr stage as we speak….have just moved 44,000 parr from our Loch Arkaig facility to the hatchery and have left 37,000 larger pre smolts on site. After a grading to take out the smallest fish, these 2 stocks will then be combined to form our smolt stocking output this spring. 2016 Availability Currently there is no availability for 2016. Please inquire if you are interested for 2017. Currently there is no availability for 2016. Please inquire if you are interested for 2017. Season 2015 summary A quick summary of 2015 catch stats shows : A Total return for the whole catchment was 465 salmon and grilse find more information. This equates to a – 47% increase on 2014 and a 2% increase on the 5 yr average – 46% v 54% split between salmon and grilse, A full report for tenants will be communicated soon. A full report for tenants will be communicated soon.